"Like it or not, it's a fact." 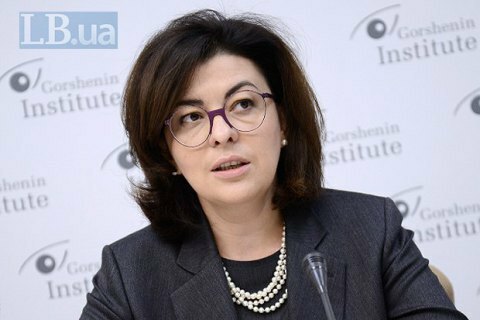 Vice-Speaker of the Verkhovna Rada Oksana Syroid believes that the introduction of a special order of local government in the Russia-occupied territories of Donetsk and Luhansk regions will mean the collapse of Ukraine. Speaking at a round table conference in Gorshenin Institute on Monday, 9 October, the lawmaker said as she commented on the vote the Donbass reintegration bills that Rada adopted on Friday, October 6: "For Ukraine, it does not mean anything good, because launching, or coming into force, or even setting all the tools envisaged in the bill, will inevitably lead to the collapse of Ukraine." "Like it or not, it's a fact. For example, the head of US intelligence has clearly said when speaking in Congress that the implementation of the political part of the Minsk agreement in fact allows the Kremlin control both foreign and domestic policy in Ukraine without a single shot. Territories with such a status will be able to control everything," Syroid stressed. She sharply criticized the bill that defines the status of the occupied territories in Donbas. "As an author of a bill on temporarily occupied territories, which we registered two years ago, I can say that [the presidential bill] has no safeguards against consequences that the bill on recognition of the status of temporarily occupied territories is fraught with. Why they should be recognised at all?" "Not just for declarations' sake, but for the Ukrainians, who have suffered from the occupation could protect themselves, to protect soldiers who have for three years fought to protect us, because they cannot protect themselves," she stressed. "The next generations, if not we, should have a document to which they can refer to expect Russia's responsibility for this aggression and occupation," Syroid said. According to her, the president's bill is lacking the date marking the start of occupation, the a procedure for the recognition of a territory as occupied, terms of de-occupation conditions, trade restrictions, etc..
"In the absence of these things, this bill is nothing but another act of mimicry to postpone with this decision, and an attempt to dodge responsibility for the fact that the president within three years did not to take decisions that should have been taken," Syroid concluded.